Since 1978, successive military and quasi-civilian governments of Myanmar have been persecuting the Rohingya in Western Myanmar. Myanmar military has viewed Rohingya Muslims, who are pre-nation state borderlands people living along the present-day Bangladesh (formerly East Pakistan) and present-day Myanmar as a ‘threat to national security’ because they are the only Muslim community with their own historical ancestral land, which is adjacent to one of the largest Muslim countries. This is a manufactured claim by the military institution which is neither based on the facts nor reality. The persecution is commonly acknowledged as genocidal by various human rights organizations and investigators or researchers including the United States Holocaust Memorial Museum, International State Crime Institute, Genocide Watch, former UN Special Rapporteur on the situation of human rights in Myanmar (2008-2014) Mr Tomas Ojea Quintana, leading scholars of genocide George Stanton and William Schabas, anti-apartheid leader Desmond Tutu and Amartya Sen. Despite international outrage and call on Myanmar government to stop atrocity crimes against Rohingya, Myanmar pays no heeds so far and continues inflicting massive suffering on Rohingya. · Dutch government to put direct diplomatic pressure on Myanmar government to stop atrocity crimes against Rohingya civilians; and to initiate necessary measures through European Union, and United Nations to stop Myanmar committing atrocity crimes; and to bring all those who have been committing “ethnic cleansing of Rohingya” into justice. · International Court of Justice to initiate process to bring perpetrators of “ethnic cleansing of Rohingya” into justice. 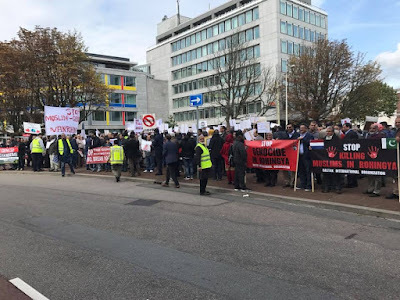 · Dutch media to bring Myanmar’s “ethnic cleansing of Rohingya” into public attention and to inform Dutch public with what have been unfolding against Rohingya people.